Have you ever been completely surprised by the way God directs your life? Never in my wildest dreams did I ever imagine that I would have the privilege of travelling to Africa. And I could never have conceived the impact it would have on my life. As the National Media Coordinator, it was my task to convey Hope and Healing International’s life-changing work to Christian and secular media. To be effective in my new role, I wanted to see for myself how our supporters’ dollars were being spent overseas and witness the impact we were making in our Hope and Healing International-partner projects. So I went to visit some of our partner-programs in Zimbabwe and Malawi. What did I find? In Zimbabwe, I met parents in rural and urban areas who had been given micro-finance loans and training support. As a result of these loans, the parents were providing for their families through the successful small businesses they had created. At a residential school for children who are deaf, and at a vocational school for young adults with disabilities, I was touched to see that — thanks to the generosity of Canadians — many children and young adults’ lives were completely being transformed with hope and joy. I met 20-year-old John, who was born with twisted legs and who, as a child, had both of his legs amputated below the knee. John was so excited to receive vocational training at the Bulawayo Centre Vocational School. In Malawi, I went to a medical assessment clinic being held by a Hope and Healing International-project for people with disabilities. There, I saw parents and grandparents sitting on a concrete floor, patiently waiting in line for their children or grandchildren to be examined. A small bus waited outside to take those who had already been identified as needing surgery, to a hospital in Lilongwe. I still remember looking at the faces of those moms, dads and grandparents. They each had a look of expectancy and hope that the doctors and surgeons would be able to heal their child or grandchild. Children with burn contractures, leg deformities, bowed legs, cleft lip and palate…each precious child waited their turn for the staff to examine them. And, because people like you care, our Hope and Healing International-partner was able to give those children the free medical treatment and/or surgery that their parents or grandparents could never have afforded. To this day, I get a catch in my throat when I think about the children I met as I travelled in Africa. One particular child, Sadik, stands out in my memory because I didn’t think he would even live long enough to be able to get taken to a hospital. I was bouncing around in the back of an SUV as we rode over some of the bumpiest dirt roads I’d experienced so far. Julius, a Community Worker for our grassroots partner – MACOHA – was riding on his bicycle ahead of us. For Julius, it was clearly more than a job to find every child with a disability in his catchment area – it was his burning passion. That day – although Julius didn’t know it yet – he was looking for Sadik. When we arrived in the remote village, a group of children crowded around us. A woman from the next village pushed her way through the crowd and urged Julius to come with her quickly because she had found a child in dire need. After a brisk 15-minute walk, we heard the faint sound of a child crying. As we got closer, I could hear a child wailing inconsolably. When we arrived and saw three-year-old Sadik in his grandmother’s arms, I felt helpless. “The child is not walking yet,” the grandmother murmured. “When the child is feeding, he can’t swallow, he can’t get food inside his mouth …it comes back out through his nose.” Sadik’s tummy was extended from obvious malnutrition. Sadik had both a cleft lip and palate. Immediately, Julius got out his pen and case notebook, and wrote down the tiny boy’s information. Suddenly, I felt a flicker of hope. I knew that this simple act of writing down Sadik’s name meant that the process of rescue had begun. It meant that Sadik would get the medical care he so desperately needed. Since retiring as an employee at Hope and Healing International for 17 years, I have since returned to volunteer. Why? Mainly for the following reasons: I love the work that Hope and Healing International does; I love the dedicated staff and volunteers; and I love the people we serve. Dear friends of Hope and Healing International, I don’t know you personally, but I want to assure you that Hope and Healing International is making a huge difference in the lives of the poorest people in the poorest communities in the world. I know. I’ve seen it firsthand. When we got home from our trip, Ed Epp, our Executive Director, sent out a request to our Canadian supporters, asking them to pray for Sadik — that he would remain healthy until he could get the medical attention he so desperately needed. I believe in the power of prayer. I have witnessed it in my own personal life. And I witnessed it with Sadik. God honoured the prayers of those who prayed for this vulnerable little boy. Sadik was indeed able to remain strong enough to survive the three months until he could travel to Hope and Healing International’s partner hospital. Once there, he was fed nutritional meals until he was physically strong enough to withstand the surgical procedure. His cleft lip and cleft palate were successfully repaired, and little Sadik –- once malnourished and struggling to eat — is now a thriving, healthy young boy. Sadik went from being a child who faced most certain death to a child with a hope-filled future. God bless you. And thank you for your faithful prayers and for any financial support you’ve given to Hope and Healing International. You are helping to bring hope and healing to the world’s most forgotten people. You are changing lives and valuing people with disabilities as Jesus does. Thank you! Dr. Julian Eaton is Hope and Healing International’s mental health advisor for West Africa. He lives in Togo with his wife, Polly, and their two children. He was born in the Democratic Republic of Congo and trained as a doctor in London before specializing as a psychiatrist. Prior to moving to Togo, Julian and his family lived in Nigeria for 8 years. During a trip to North America, Dr. Eaton visited our office to answer questions about mental health in some of the poorest parts of the world. Question: Why is mental health work so important in developing countries? Dr. Eaton: Mainly because it is neglected. I mean, it [mental health] is progressively recognized as one of the biggest causes of disability, and that’s not just me saying that. It is something that when you start systematically measuring disabilities, mental health comes right at the top of the list. And historically no one thought to ask questions that included people with mental health problems. If you go and visit a big African city, you will usually see people who are dressed in rags, and have got hair out to here, because they completely neglected their own self-care. They have schizophrenia, and they are homeless, and abused – often physically or sexually abused, and the only reason they are like that is because they don’t have access to services. These conditions are treatable, and people can have their lives transformed with very simple, efficient interventions. Dr. Eaton: It will become the biggest cause of disability by 2020. Question: How does that lead to physical disability or is mental illness something that is disabling in itself? Dr. Eaton: For someone with mental illness, it prevents them from being engaged in society and doing the things they want to do. If someone is very depressed, they are not going to get out of bed, or get a job. Disability is often thought of as an impairment, but it’s society’s reaction to mental illness that disables a person. People who’ve had depression and are not depressed anymore – they could go out to become part of the community, but they are completely shunned. They are excluded from social life, so that makes them disabled. Question: What are the stigmas and misconceptions that block a person with mental illness from being a part of society? Dr. Eaton: Well, they vary with cultures and countries. But, speaking very broadly, mental illness is related to strange behaviours, so often there is a strong spiritual element. People think the person is cursed or possessed, or God is punishing them for something they have done. It’s very mysterious to them. Schizophrenia, for example, makes people behave in very strange ways. They hear voices and behave aggressively and don’t seem to be themselves, but they were fine up until then. So people say, “What happened to this person? Something came upon them.” So most of the stigmas come from a spiritual cause where they believe something has taken hold of a person, a spirit of some sort. There are other beliefs that are just wrong. In some regions, many people believe that epilepsy is contagious. So you have parents coming and saying, “Unless you take that child out of school, my kids are not going.” And routinely children with epilepsy never go to school because of this. That’s going to impact them the rest of their lives. Question: How do you correct the misinformation about mental illness? Dr. Eaton: We normally try to have a comprehensive project. These things fit very well together. For example, in southeast Nigeria, they have been running health services for a long time, but the use of their health services went through the roof when we had mental health awareness campaign in that area. The mental health awareness campaign was doing several things. One of the main ones was to de-stigmatize and demythologize; to say to people, “Look, someone with epilepsy cannot give you epilepsy. That’s not going to happen.” People are not to blame for their condition. This is not a spiritual affliction and we know that if the person receives this kind of care they’ll get better. So those two things often go together: you can have the best services in the world, but if the community around doesn’t know about medical care available, then it doesn’t get used. Question: And what is the response when misinformation about mental health leads to human rights’ abuses like chaining people up because they have mental health problems? 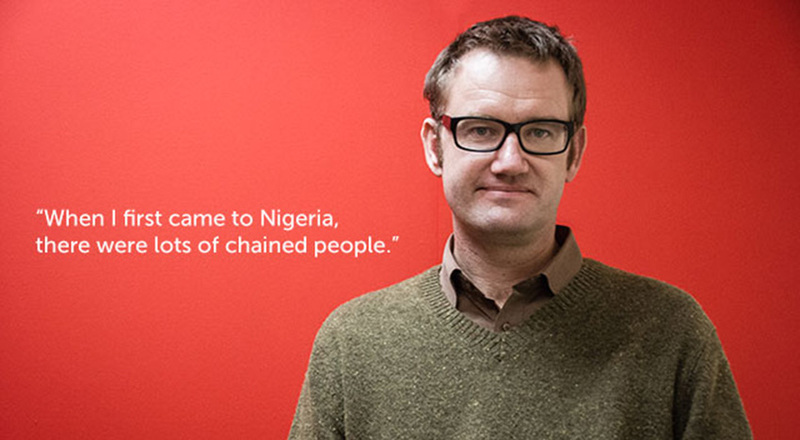 Dr. Eaton: When I first came to Nigeria, there were lots of chained people. My initial thought was how terribly cruel to punish someone in this way. But when you talk to a family, and you understand what they’ve been through, it’s usually the end of a very long road, where they have taken this person to traditional healers, to psychiatric hospital in the capital city, to everywhere they can try. They are at the end of the road, and they just don’t know what else to do. And in a context where quality service is not available, families feel like they have no choice but to chain up that person. And what we offer is an alternative to these people. Sometimes it’s a way to get into the government and say, “Look, there is no justification ever for someone to be chained up. These are treatable conditions. These are situations that can be resolved in a humane, ethical, and quite inexpensive way. There is no justification for this.” So this is a way in for us to say, “Let’s provide services here to stop this from happening again.” Otherwise it’s an appalling abuse of human rights. Question: Why are Legacy Gifts so important to the work that you do? Dr. Eaton: It’s people who give gifts in their Will, who in a very large part enable us to rescue people from being chained up in the communities where we work. They allow us to have greater resources being allocated to mental health in low income countries, both for services to be developed and to give a voice to people who were not visible. People like the ones who were chained up and couldn’t speak for themselves. Their voice is being heard now because of Legacy gifts and the work Hope and Healing International is doing. Dr. Norgrove Penny is an orthopaedic surgeon in Victoria, British Columbia. He also works for Hope and Healing International as the Global Advisor on physical impairment issues. In this 2-part interview, Dr. Penny describes his experience piloting a clubfoot program in Uganda and his passion for Hope and Healing International’s ongoing work. Fresh off the plane from four years working at Nkhoma, a Hope and Healing International-supported eye hospital in Malawi, ophthalmologist Dr. Will Dean recently visited our head office in Stouffville, Ontario. We took the opportunity to ask Dr. Dean about his time in the field and he graciously shared with us about his work, the life-changing impact of legacy gifts and their importance in Hope and Healing International’s ministry. These are the most forgotten people in the world. Children who aren’t given the chance to go to school because they can’t see, can’t walk or can’t hear. Moms and dads who can’t apply for mainstream development programs, because disability without support and training makes them a “poor investment”. These are the poorest one billion people in the world. We are helping them because God’s wide and deep love calls us to. Setting them free… for life! Our goal is to rescue and restore these people – giving children hope, taking whole families and communities out of grinding poverty, and building a bridge between them and their communities. Setting them free… for life! For most of us, a charitable gift in our Will is the greatest, most wonderful gift we’ll be able to give in our whole lives. It’s a chance for you to plant the seeds of compassion and generosity – a reflection of your values and beliefs. It’s your chance to give lifetimes of sight, ability and hope to some of God’s most vulnerable children. restore the sight of 16,531 people. Moms and dads will be able to see their children and earn a living. give 1,791 children leg-straightening, eye-opening, heart-rejoicing medical care. Imagine what a Gift of a Lifetime can do! That’s 25 sighted breadwinners and caregivers who can lift their families out of poverty. $4,000 CAN PROVIDE AN ENTIRE COMMUNITY WITH CLEAN WATER, saving children and families from deadly diarrheal diseases and painful eye, ear and bone infections that could lead to life-long disabilities. $12,000 CAN EQUIP 6 EYE SURGEONS with the tools to provide sight-restoring operations for thousands of people. $19,000 CAN TRAIN A LOCAL SURGEON to give sight-giving, ability-restoring medical care today and into the future for thousands of moms, dads and children. $37,500 CAN FINANCE AN ENTIRE MOBILE HOSPITAL OUTREACH CLINIC delivering disability-preventing health services to 950 children, moms and dads. $125,000 CAN BUY A PATIENT TRANSPORT VEHICLE, enabling thousands of remote patients to finally access the care they desperately need. Get your FREE copy of A Legacy of Love DVD.